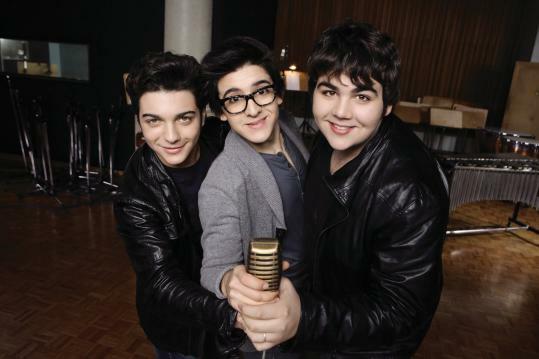 The cherubic teens of the Italian popera trio Il Volo - Piero Barone, 18, Ignazio Boschetto, 17, and Gianluca Ginoble, 16 - are already a hit in their home country with their 2010 self-titled debut, which includes new pop tunes written just for them by hit makers including Diane Warren, older favorites such as “Smile,’’ and enthusiastic renditions of classics like “O Sole Mio.’’ The album will be released worldwide later this year. 1. Adele. Barone is partial to the British vocal powerhouse, name-checking “Someone Like You,’’ “Turning Tables,’’ and “Set Fire to the Rain’’ as favorites. He says her music puts him in the right frame of mind to perform. 2. Elvis Presley. The teen was introduced to the King of Rock by his grandfather. Il Volo plays the Orpheum Theatre with Chloe Flower on Oct. 18, 7:30 p.m. $28-$68. 800-745-3000, www.ticketmaster.com.